Macy’s Thanksgiving Day Parade 1934. One of the original Mickey Mouse floats. Photo courtesy of ipoll.com. Thanksgiving, a time of year that we all think about. We get to go home to be with family, eat a ton of food and gather around the television to watch the Macy’s Thanksgiving Day parade. Unfortunately, over the years we have lost sight of why we celebrate Thanksgiving and its history. The same goes for the parade. We now look at it as just something to entertain ourselves with as we wait for our turkey dinner to be done cooking. The traditional first Thanksgiving is surrounded with myth and legend. The pilgrims did celebrate Thanksgiving, just not in the way you would think. They celebrated “Forefather’s Day” which happened on Dec. 21 or 22. Several presidents, including George Washington, made Thanksgiving a one-time holiday. Sarah Josepha Hale started to ask several presidents in order to make Thanksgiving a national holiday. It wasn’t until 1863 that Abraham Lincoln finally made Thanksgiving a national holiday. In 1939 President Franklin D. Roosevelt proposed to congress that Thanksgiving was to take place on the fourth Thursday of November. Going back to the pilgrims’ first Thanksgiving, which began someday between Sept. 21 and Nov. 9, many think that it took place in early October. To this day there are only two contemporary accounts of what happened on the Thanksgiving in 1621. These two accounts come from Edward Winslow and William Bradford. What Winslow and Bradford had to say shows that at the first Thanksgiving they did not eat the type of food that we eat today on Thanksgiving. Their menu consisted of five deer, a large number of turkeys and waterfowl, cod and bass. Their harvest included wheat, corn, barley and peas. Coming from this, we have been able to learn over time that the Indians never introduced the pilgrims to popcorn. The corn that the Indians grew was a type that did not pop well. The Indians and pilgrims first met each other when the pilgrims went to hunt and the Indians heard their gunshots. Once the Indians realized that they were not there to hurt them, they welcomed them. Unfortunately the peace between the pilgrims and Indians only lasted for a generation. Some myths that go along with the first Thanksgiving are what the pilgrims wore. The pictures we see today are black clothing when in reality they wore bright and cheerful colors. Macy’s Thanksgiving Day Parade 1984. Tom Turkey is famous for starting the parade every year. Photo courtesy of duff.com. Other than our wonderful Thanksgiving dinner, another tradition for many families is watching the Macy’s Thanksgiving Day Parade. The parade has taken place New York City since 1924. The parade attracts more than 3.5 million people every year, and 50 million people nationwide who watch the parade on TV every year. The first Macy’s Day Parade actually took place on Christmas in 1924. More than 250,000 people attended. 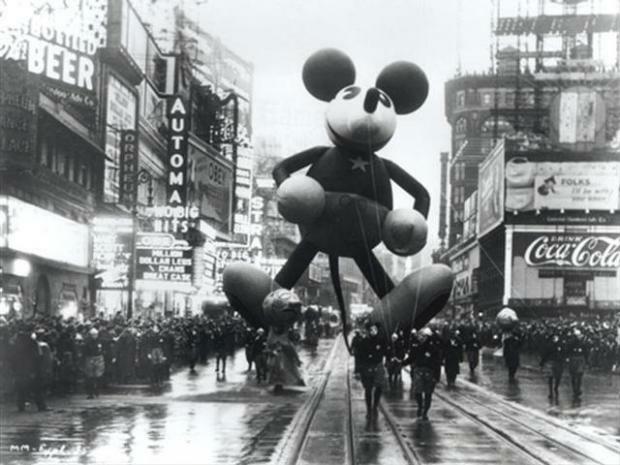 In 1927 Macy’s introduced the first of many big balloons; Felix the Cat. During the early days for the balloons they filled them with helium. After the parade they would release them after the parade with return address attached to the balloon. Even through the Great Depression, the parade continued to grow. 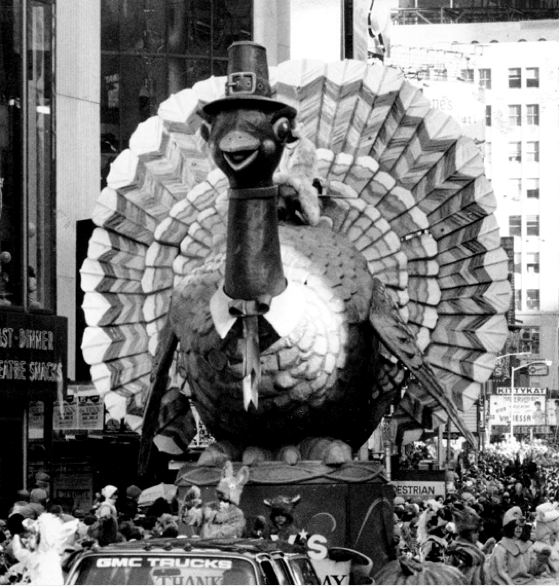 The first national radio broadcast of the parade took place on Thanksgiving Day in 1932. Two years after that, Disney decided to put a Mickey Mouse balloon in the parade. In 1939, if you had a TV, you were able to see the live broadcast on NBC. During World War II from 1942 until 1944 the parade was suspended. They used the rubber from the floats and donated them to the American Military. Today there are more than 8,000 people who participate in the parade every year with more than 4,000 volunteers. Even though we like to look at Thanksgiving as only a time for food we need to realize that there is a rich history to this often forgotten holiday. When you sit down for Thanksgiving this year, think about how it all started and really think about what you are thankful for.